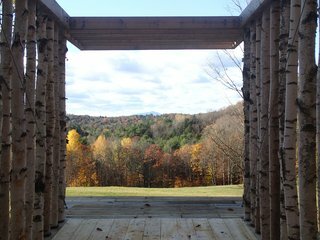 In a Vermont forest, architecture students design and build a pavilion for quiet contemplation. Each summer for the last three years, the Boston firm Moskow Linn Architects leads an intensive design-build workshop for aspiring architects called Studio North. The idea, the firm’s principals say, is to give students a chance to develop hands-on experience by designing and constructing a structure that engages with a rural landscape. 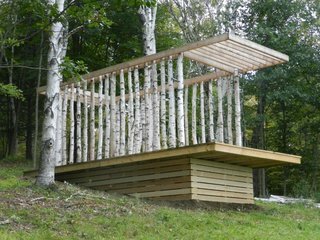 The Birch Pavilion sits atop a 14-by-26-foot platform composed of hemlock and pressure-treated timbers. Photo courtesy of Moskow Linn Architects. 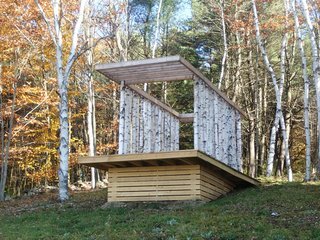 In 2011, Studio North’s inaugural summer, five students gathered in Norwich, Vermont, where architect Keith Moskow lives, and designed a chicken coop with a gabled roof that mimicked that of a neighboring barn. Overhanging rafters establish vestibules at both ends of the structure. Photo courtesy of Moskow Linn Architects. 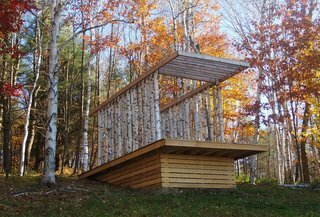 This past summer, Moskow and his partner, Robert Linn, returned to Norwich with a new group of students who set about designing a structure on a gently sloping, wooded hillside. "The intent was to create a sacred space," Moskow says. "Not a place to pray, but a place to enjoy and celebrate nature." The pavilion is framed with 34 lenghs of timber, each about 8 inches in diameter and cut to a length of 9 feet. Photo courtesy of Moskow Linn Architects. The first step was to clear the site of undergrowth and site the structure so it would be oriented toward Mt. Ascutney, 25 miles away in Windsor, Vermont. Then the students selected and harvested 8-inch-diameter birch timbers, cutting 34 of them to a length of 9 feet. The timbers were set in a line on a 14-by-26-foot platform that was oriented to frame a view of Mt. Ascutney in the distance. 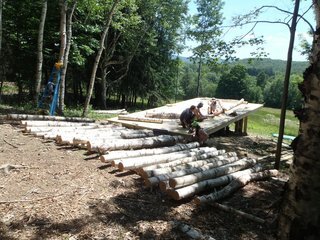 The Birch Pavilion under construction. Photo courtesy of Moskow Linn Architects. 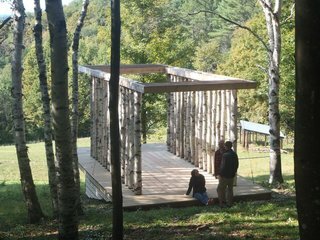 The Birch Pavilion, as it is known, is open to the sky, with overhanging rafters forming a vestibule at each end. Eventually, ivy will cover the pavilion’s base. The pavilion is oriented to capture views of the clouds, stars, and foliage. Photo courtesy of Moskow Linn Architects. 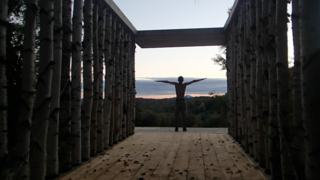 Since its completion in the summer of 2013, the Birch Pavilion has been used for two memorial services, a mediation retreat, a yoga class, and family gatherings, Moskow says. A small wedding is scheduled to take place there in the spring. Construction of the pavilion was completed in the summer of 2013. Photo courtesy of Moskow Linn Architects. The pavilion frames a view of the peak of Mt. Ascutney, 25 miles in the distance. Photo courtesy of Moskow Linn Architects.